Located just 30 miles (48km) from Portland, Kennebunkport is a popular destination for weekends, especially those escaping the heat in big cities like New York and Boston. This pretty town is known for its laidback and genteel atmosphere. Several golf courses, antique shops, art galleries, and a busy harbour draw in well-to-do holidaymakers, and both former President Bushes are often seen at the nearby Bush holiday home. However, the most popular attraction in Kennebunkport is its beaches. Kennebunk Beach, Gooch's Beach, Mother's Beach, and Parson's Beach are all packed on weekends each summer, and guests can hire kayaks, boats, surfboards, as well as scooters and bicycles. 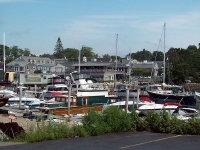 Common activities in Kennebunkport include whale-watching, fishing, sailing, and horseback riding. Visitors can even take a ride on a working lobster boat to get up close and personal with Maine's most famous crustaceans.